The San Gennaro Festival is currently being celebrated in Little Italy, and after years of avoiding rather than indulging in the tourist packed festivities, this week I found the big heart of Little Italy still thrives with la dolce vita. Sean and I were filming our documentary with Joey so we had the privilege – and fun – of talking to long-time local characters behind the scenes. 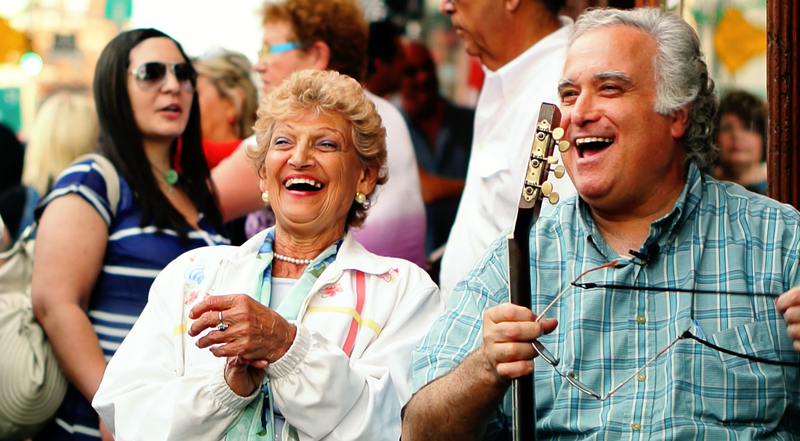 San Gennaro is a religious commemoration of faith surrounding the miracle of the Patron Saint of Naples, but above all it is a celebration of life and a special time when past & present residents get together. The area around Mulberry and Grand streets were pedestrian only, and with the opportunity of sunshine and serendipity, our cameras were working overtime. We ate cannoli’s and meatballs and drank expresso, and we heard fabulous stories from Baby John and Fat Ernie. Ernie even sang for us, playing his guitar while he sat in front of his shop, acknowledging friends as they walked past. An elderly woman who used to live in the neighborhood joined him for an aria, and at the end we all had tears in our eyes. There will be a lot more to tell when the movie is finished, but for now here’s a picture to share…. This entry was posted in events, Food, Fun and tagged Little Italy NYC, San Gennaro. Bookmark the permalink.